Back in 1998, I checked and there was only a couple books about index funds. I decided to write and publish a book about index funds. 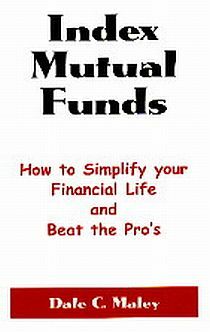 My goal was to create a book that could be read in less then one hour, which would teach people the basics of index funds. I published the book in early 1999 and it was posted in Amazon for sale around January 1999. I am going to take this opportunity to tell you how much we appreciate the extremely favorable Review you gave our" Bogleheads' Guide." That was a very nice thing to do for a book competitor. I am glad our book familiarized you with the term "investment pornogrophy." You may not remember, but you sent me your book, "Index Mutual Funds" several years ago. It is on the bookshelf beside me as I write. A good deal of what I know about index funds came from your book. Give my best to Connie. Interest in index funds peaked in 1999 after the S&P 500 stock index had high double-digit returns in 1998 and 1997.